It was the terrorist attack that police and security services always feared, but hoped would never come. A man, dressed all in black, drove a car at 80kmh the full length of Westminster Bridge, aiming deliberately at pedestrians and cyclists. The bodies were scattered in his wake. One woman died after she was hit and thrown under the wheels of a bus; another woman was struck as she walked past a stand selling postcards to tourists. She lay on the ground under the shadow of Big Ben, blood pouring from the wound in her head and seeping into cracks in the pavement. The driver of the Hyundai 4x4 then crashed the vehicle into the iron railings that surround the Palace of Westminster, hitting at least two more pedestrians. He leapt from the car and ran around the corner, brandishing a kitchen knife, eight inches long. Hundreds of tourists and workers panicked into a "stampede", ran for their lives while the attacker, now on foot, headed for Parliament Square and pushed past police officers at the barrier to New Palace Yard. Just within the entrance he slashed and stabbed at an unarmed policeman, who would later die of his wounds. It was only then that the marauder was stopped in his tracks as, at just after 2.40pm, a plain clothes officer, possibly a minister's personal bodyguard or a member of the security services, pulled out his pistol and fired two, possibly three, shots into the intruder's chest. 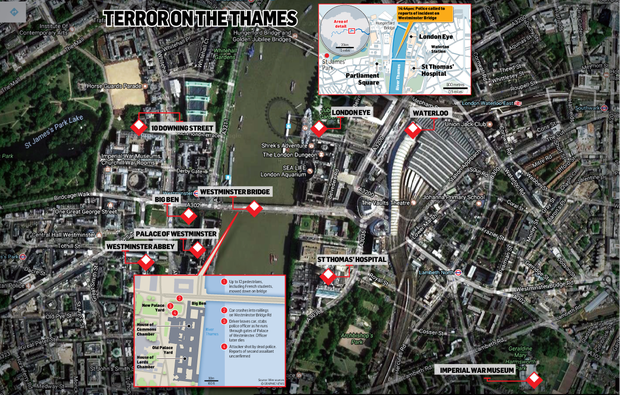 Terror had struck at the very heart of Britain and its government. 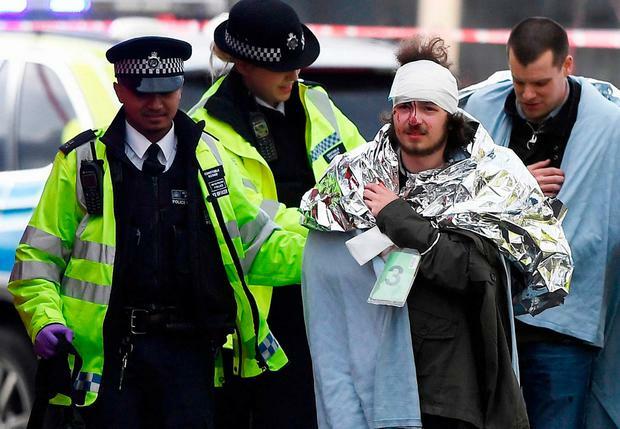 The British Prime Minister Theresa May had been due to leave the House of Commons for the short drive to Downing Street when the attack happened. "This is a day that we had planned for - that we all hoped would never happen - but sadly it is now a reality," said acting deputy police commissioner Mark Rowley, who is in overall charge of Britain's counter-terrorism police. Mrs May would later declare, in a speech just before 9pm on the steps of Downing Street: "We will never give in to terror; we will never allow hate and evil to drive us apart." The carnage had begun a little over six hours earlier. "At first I thought the car had lost balance, but he was going in and coming back in a zig-zag, he did it about three times," said Ismail Hassan (45), who was riding his motorbike on Westminster Bridge when he saw the £30,000 (€ 34,666) grey Hyundai Santa Fe - registered in Chelmsford, Essex - career towards him. "When he got to the shop he started hitting people, driving into people. The car was hitting people on the pavement," he said. One victim was seen trapped under the rear wheel of a bus. A junior doctor later confirmed the worst. Colleen Anderson at St Thomas' Hospital said a female pedestrian had died. "I confirmed one fatality. A woman. She was under the wheel of a bus. She died, confirmed her death at the scene." Dr Anderson added: "There were people across the bridge. There were some with minor injuries, some catastrophic." Another eyewitness told of seeing a body floating "face-down" in the Thames below. It wasn't clear if the woman he had seen in the river had been hit by the car and tossed over the bridge or had jumped into the water to avoid being hit. She was later pulled alive from the river. Another body could be seen lying at the foot of the stairwell that leads up to the bridge from the river footpath. The victim had either jumped or was flung on to the rain-soaked paving slabs below. It didn't look like anything could help him. Later, a white and blue scene of crime tent was pitched over the body and a stretcher brought to the scene. The victim would have been one of the first to be hit. Back on the bridge, three French schoolboys on a trip to London had been critically injured. "Three of us were hit, we don't know if they are dead or not," said the group's teacher. "I cannot speak anymore, I don't know what to say." One of the group of 10 - a young teenage girl - sat and wept openly on a bench a few hundred yards from the scene of devastation and destruction. She was wrapped in a foil blanket and being comforted by fellow pupils. Martin Pearce (32) filmed the aftermath. "There is blood everywhere," he said. "I don't know why I'm crying but people have been shot or stabbed all over the place." In truth, what he had witnessed was the result of a car used as a weapon. Police officers were also hit and injured. They had been walking along the bridge, having just come from a commendation ceremony. One of the group, who was in his 30s, suffered a head injury. He was being treated last night at King's College Hospital, south London. The hospital said it was treating eight patients in total, two of them critical. After perhaps 10 seconds, the Hyundai had come to a halt just off the bridge; the driver, deliberately or otherwise, having crashed into the railings opposite parliamentary offices in Portcullis House. Eyewitnesses had described how the bearded man, said to be of Asian appearance and in his 40s, had then leapt from the car. But his attack was far from over. Rick Longley (50), a health and safety manager from Tunbridge Wells, Kent, recalled: "He got out the car. I was standing next to the policeman right at the entrance where Big Ben is right behind you. "There was a car crash and all the crowd surged around the corner. I couldn't work out why they were surging. But as the crowd surged, this guy with a beard came over my shoulder, brushed me and then he got a huge knife and was plunging it into the policeman. He was literally with a huge knife plunging it into this guy. "I've never seen anything like it. The policeman was cowering. He didn't know what to do." Katie Marthini, who was on holiday and visiting Westminster, said: "We heard four shots. It was in the enclosure next to Big Ben. It's terrifying we ran. Everyone was running." 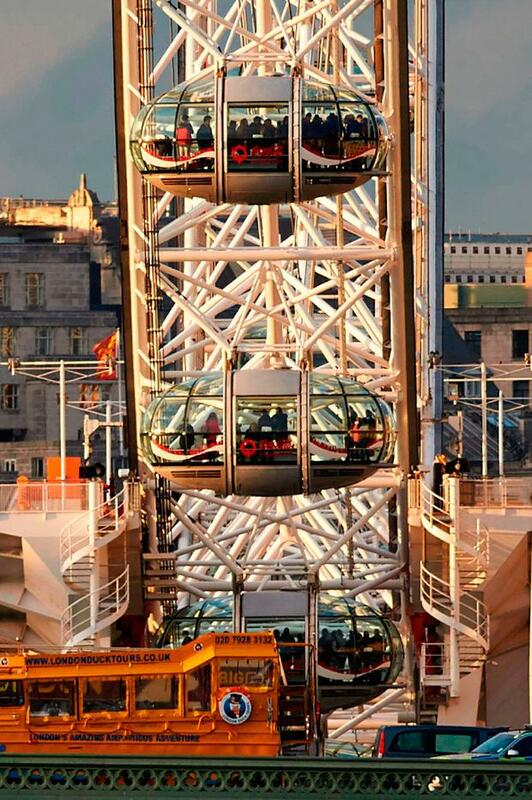 Jayne Wilkinson, another tourist, said: "We were taking photos of Big Ben and we saw all the people running towards us, and then there was an Asian guy in about his 40s carrying a knife about seven or eight inches long," she said. "There were three shots fired, and then we crossed the road and looked over. The man was on the floor with blood. He had a lightweight jacket on, dark trousers and a shirt. He was running through those gates, towards Parliament, and the police were chasing." Her partner, David Turner, added: "There was a stampede of people running out. You saw the people and you thought 'what the hell is going on'." Journalists had witnessed the events too. Gordon Rayner said: "A man who appeared to be carrying a knife, who had got around 25 yards inside the gates, was rushing towards a policeman who pulled a pistol and fired three shots into his chest from around six feet away. "Knocked off his feet by the impact of the bullets, he fell backwards on to the cobbles." Quentin Letts, a parliamentary sketch writer, said: "I saw a thick-set man in black clothes come through the gates... he had something in his hand, it looked like a stick of some sort, and he was challenged by a couple of policemen in yellow jackets. "And one of the yellow-jacketed policemen fell down and we could see the man in black moving his arm in a way that suggested he was stabbing or striking the yellow-jacketed policeman." He added: "As this attacker was running towards the entrance two plain-clothed guys with guns shouted at him what sounded like a warning, he ignored it and they shot two or three times and he fell." Inside parliament, security services went into overdrive. Mrs May had been in the voting lobby and was bundled out of the Palace of Westminster and into a waiting silver Jaguar car. Andrew Bridgen, the Conservative MP, saw Mrs May being led to safety: "I've watched the prime minister moved away by the biggest plain-clothed police officer I've ever seen. He put his arm around her and took her very quickly away." 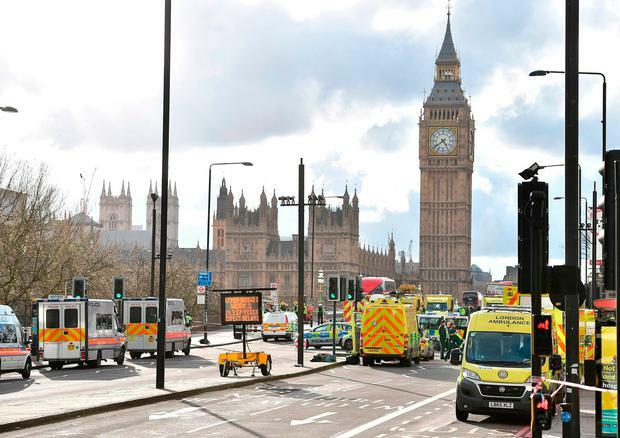 Outside the Palace of Westminster, the emergency services had gone to work, setting up makeshift treatment areas for the wounded. An air ambulance landed in Parliament Square. Some 53 year six pupils from St John and St Francis School in Bridgwater, Somerset, had been on a trip to the Palace of Westminster. To calm their nerves, the pupils, aged 10 and 11, began singing. A Labour councillor later tweeted: "Apparently there are schoolchildren singing songs in Parliament to lift people's spirits." It was a rare moment of humanity in a terrible, terrible day.